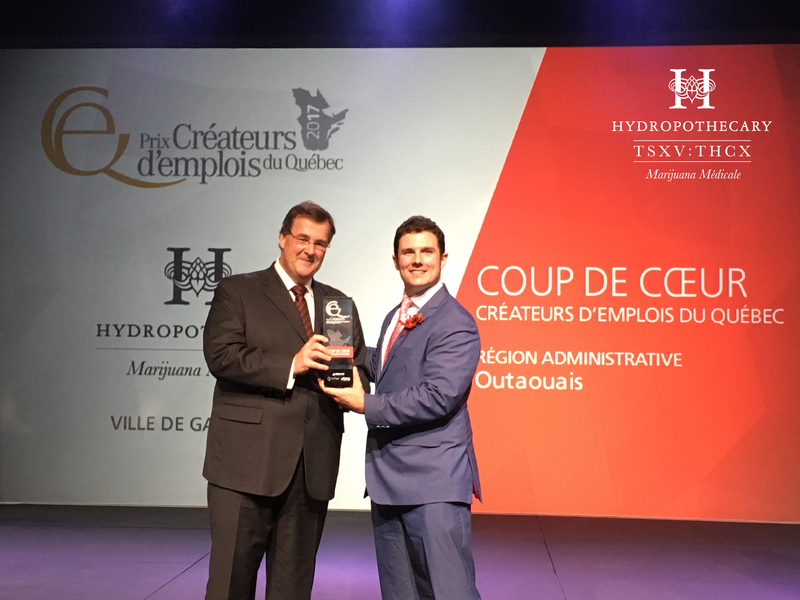 GATINEAU, QC--(Marketwired - October 06, 2017) - The Hydropothecary Corporation ("THCX" or the "Company") (TSX VENTURE: THCX) is pleased to announce it has been awarded the Coup de Coeur Award at the inaugural Québec Employment Creators Award. The awards are given annually to honour major job creators in Quebec and its 17 administrative regions. The awards highlight exemplary efforts made by companies in job creation, as well as their contribution to innovation, strategy and impact in sustainable jobs development within the province. In the 2015-2016 contest period, Hydropothecary created 28 skilled jobs from entry level to corporate positions, including customer experience, order fulfillment, operations and human resources at its Gatineau-based facility. In 2016-2017, Hydropothecary created 77 jobs and its plans for expansion throughout 2018 will create another 100 jobs in Quebec. "As Quebec's only licenced producer of cannabis, Hydropothecary is deeply honoured by the recognition this award brings to our work in building a responsible, regulated and innovative cannabis industry in Quebec and to be an economic driver in the local economy," said Hydropothecary co-founder and CEO, Sebastien St-Louis. "We are also humbled to be included amongst such impressive companies and fellow award winners. We look forward to participating in the awards next year," he added. Mr. St-Louis accepted the award during a gala presentation at the Quebec City Convention Centre, accompanied Mrs. Andrée St-Cyr, HR Generalist, and Mr. Pierre Killeen, Vice President, Corporate Communications and Government Relations.